There is a problem that the VCP is facing today, one that has sparked much debate among the top members of the Communist leadership. This problem has much to do with Vietnam’s relationship with the two juggernaut nations: The United States and the People’s Republic of China. 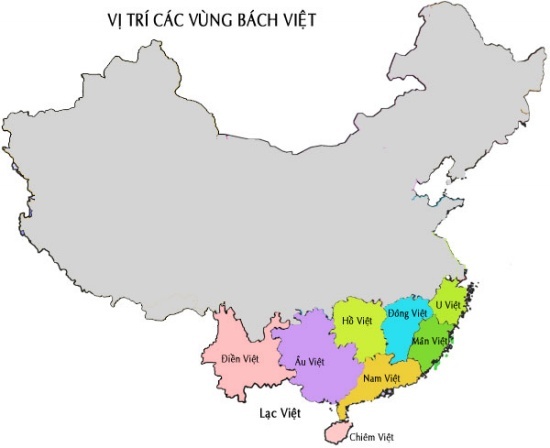 It is obvious that both of these countries play a major role in Vietnam’s economic operations, as both countries share interests in Vietnamese goods and services. However, the relationship that Vietnam shares with these two countries is highly delicate. Every action that Vietnam makes, it must do so in a manner that defends the country’s interests without alienating its partners. This task is more difficult than it sounds however, as China and the U.S. have very different objectives. In most cases, American interests tend to conflict with the Chinese, which usually means that any stance taken by the Vietnamese government will conflict with at least one side, if not the other. Therefore, in order to maintain a good footing politically, the Vietnamese government will have to take strategic steps that will protect the country’s interests. One of the major issues that prevents further cooperation between the U.S. and Vietnam is the VCP’s constant abuse of human rights. The totalitarian dictatorship of the Vietnamese Communist Party raises many barriers for the United States in terms of establishing economic and military ties. Some of the members in the VCP want to better relations with the U.S., they might even want to improve the human rights situation in the country. Unfortunately, other factions in the Party are bent on maintaining power, even at the price of losing land to the Chinese. Which brings me to the other side. It is possible to distinguish the Liberal strand of the Party from the Conservative branch, though the individuals responsible are still less than clear. The Liberal camp can be characterized as those who want to develop closer ties with the United States and stand up to China on issues like Paracel and Spratly. They are the ones who might take a second look at reforming the Party in order to move forward. The Conservative side are the ones who want to maintain the Party rule, no matter what the cost. These guys side with China in order to cling onto their power, disregarding everything else. In other words, they are the puppets of China. So what is the Communists’ Dilemma? Well, let’s sum it up. The Communists today are faced with a choice: either side with the U.S., make the necessary changes to the system and risk the complete disintegration of the one-party system, or side with China, continue to suppress the people, slowly let the land get taken away, but then carry on the rule of the Party. The dilemma can be summed up by the following: “Side with the U.S., lose the Party. Side with China, and lose the country.” To any rational thinker, the choice is obvious: reform the country, defend the country, and let the Party fade away! Sadly, many in the VCP still regard the Party as the highest significance. They can’t think in terms of right or wrong, but only what they can do to defend their own interests. However, the circumstances have changed significantly since then. Some members of the VCP finally realize that nothing good can come from siding with China. They seem more interested in developing U.S.-Vietnam relations, maybe even to improve the country. This is more than speculation, but still requires more substantial evidence for further examination. 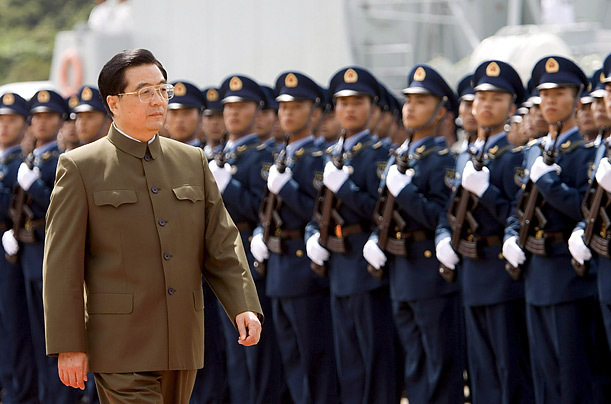 What is apparent is that the Vietnamese Communist Party is no longer set on selling out to China. At this time, the size of the resistance is difficult to measure, only time will tell if it is strong enough. 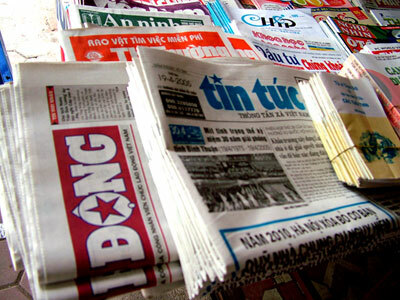 The Vietnamese government has implemented a new decree that promises to give more freedom to the media. These new provisions are designed to protect journalists that are on duty. Under the new law, those who purposefully interfere with the work of journalists will be fined 10-30 million Vietnamese dollars (approx. $500-1500 U.S.). The government decree will take effect on February 25 of this year. There is reason to be optimistic about this new law, since it might represent a step towards more freedoms for people living under the Communist regime. An idealist might argue that this is a starting point for further reforms in the system, as it gives the media more power to inform the people. This could be a positive step, but only if the Communists follow through. If the Communists fail to enforce this law, what difference would it make? As one should know, Communists can twist the story in many different ways. In some instances, they would impose false charges on unfavorable victims in order to unfairly detain them. Other times, they would distort the story so that they wouldn’t have to comply with the law, leaving the citizens to fend for themselves. Anyone familiar with Communists will know that the rule of law means nothing to them. Anything that Communists do, they do for their own interests, therefore they cannot be trusted. Another question is who the government will choose to protect. Since Vietnam’s media is state-controlled, is out of the question to suggest that the Communists may only defend those who write in their favor and continue brutalize those who opposes them? Maybe this is just a diversion to make the Communist government appear more humane in the eyes of the world. Or, maybe someone really does respect power of the press and wants to give more freedoms to the people, who knows. As I’ve stated before, actions speak louder than words, so the only thing to do is wait and see. The leadership transition ceremony in Vietnam, or as they like to call it, the 11th National Congress, has officially concluded. The majority of the Communist Politburo remains the same, as nine members hold on to their posts. The size of the Political Bureau has expanded from 15 to 17, with 8 new faces coming into the picture. 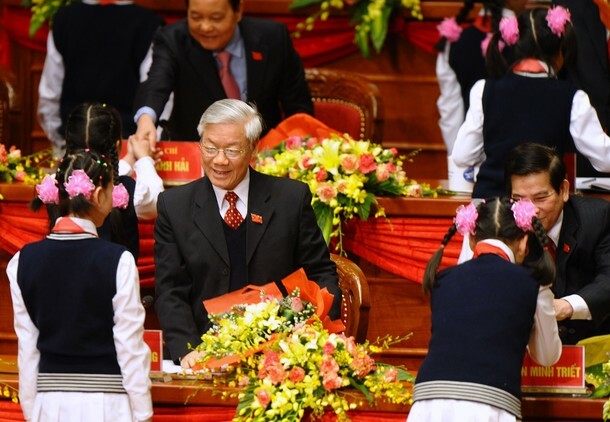 As previously hypothesized, Nguyen Phu Trong is officially the new General Secretary of the Communist Party. 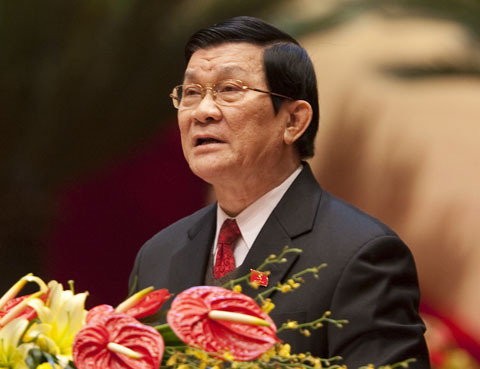 Nguyen Tan Dung retains his position as Prime Minister of the VCP, while Truong Tan Sang becomes the President. There are other new members around the Politburo, but whether they’re relevant or not is a question that is yet to be answered. Whether these new guys make a difference or not, it is without a doubt that major challenges await them. Issues like the economy, discontent among the common citizens, and the increasingly powerful and aggressive People’s Republic of China, just to name a few, require careful attention. It should be interesting, let’s just wait and see. Also, Nong Dunc Manh, now the former General Secretary of the VCP, made an apology about his personal performance and the performance of his group. It was basically just him saying sorry about all his failures as a leader, although those weren’t his words exactly. It wasn’t a very good apology, he didn’t actually take sole responsibility, nor did he address big issues like China or the dirty politics committed by the Party. He pretty much just talked about corruption and the poor outcomes of the country’s projects. Not a great apology, but what’d you expect? He’s not the greatest guy. 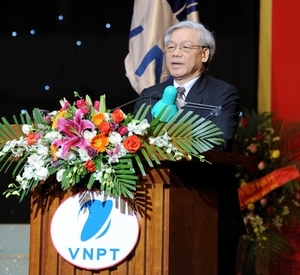 Though this is not yet confirmed, Nguyen Phu Trong (shown above) is the man likely to become the next General Secretary of the VCP, succeeding the post of Nong Duc Manh. General Secretary is the very top rank of the Vietnamese Communist Party, a position that has been continuously squandered by successively idiotic rulers. Can this all change with Mr. Nguyen Phu Trong? Not likely. From what I’ve learned, he’s just as bad as Nong Duc Manh, maybe even worse. Alright, it is possible that he might not be worse than Nong Duc Manh because seriously, Nong Duc Manh was just awful. However, Nguyen Phu Trong is not a very smart man, he is not innovative, and he does not have the guts to hold his own in the face of Chinese assertiveness. 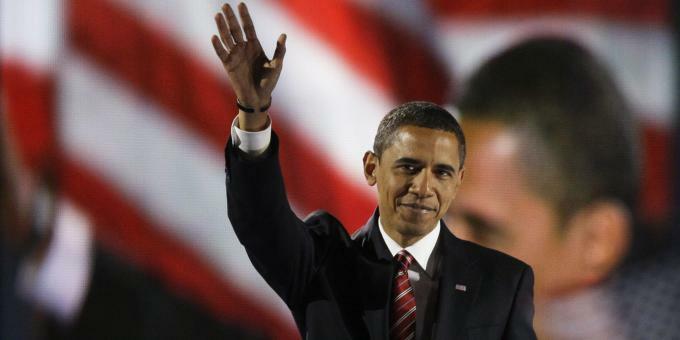 Many of his slogans and policies are repeats of old Communist rhetoric, mentioned over and over by the men of the past. He also shows weakness in managing foreign relations with the Chinese, content with being treated as the “little guy” in meetings among supposed equals. In conclusion, Nguyen Phu Trong unfortunately, does not look like a very promising leader. It is too soon to tell whether he is better or worse than Nong Duc Manh. It is true I might suggest that Nguyen Phu Trong may be a better fit leader than his predecessor Nong Duc Manh, but that is only because Manh was really, really horrible. He was so bad, it’s just embarrassing. Right now, all we need to do is take quick a look at the face of the new General Secretary of Vietnam. For the next little while, every success, failure, accomplishment and catastrophe that befalls the country will be entirely in his hands. No pressure. Acknowledging Corruption Now, So What? Prospective President Truong Tan Sang made a statement the other day about how senior members of the Communist Party “lack morality and example in lifestyle,” according to CBS News and The Associated Press. This means that Sang is willing to admit that the VCP has a corruption problem, which is usually a good thing in most cases. The question now is what he plans to do about it? Acknowledging that the VCP is corrupted shows that a change may be possible from within. However, one should not get their hopes up just yet. It is true that the first step to curing a problem is admitting it, but one should keep in mind that this is only the first step. Communist have gone back on their words too many times in the past, history has shown this. Therefore, they should not be trusted, at least not until real results are confirmed and verified. One should recall Nguyen Tan Dung’s words when he became Prime Minister of the VCP five years ago. He also pointed out that corruption was a major problem in Vietnam and wanted to do something about it. Look how things turned out with him, Mr. Billionaire, never lifting an honest finger to acquire his wealth. Who knows, maybe he actually wanted to end corruption, but after he started getting free money, he just shut his mouth. The motive is debatable, but the result is not. He is definitely corrupted now. Some might find it even more disillusioning to know that Nong Duc Manh, the outgoing General Secretary of the VCP, also made a statement condemning corruption. The reason for this disillusionment stems from the fact that Manh himself is the main source of corruption in the Communist Party. Whatever he blames on the Party all started with him, as he is the top ranking member of the entire group. He’s trying to avoid being held accountable, that is the only reason he speaks against corruption. I’m not telling everyone to dismiss Truong Tan Sang’s words altogether. What I really want to do is remind everyone that actions speak louder than words, especially when it comes to Communists. South Vietnamese President Nguyen Van Thieu once warned his people, “don’t listen to what a Communist says, but rather, look at what a Communist does.” This is a great statement, and a perfect approach to dealing with Communist propaganda. Only time will show their true intentions. Starting today, the Vietnamese Communist Party will be making a changes to its leadership along with the lower levels of the Party. 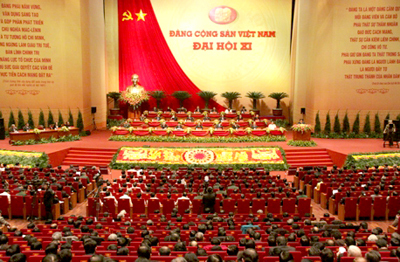 This event is known as the 11th National Congress of the Vietnamese Communist Party and will be going on for the next seven days (January 12-19). There is a lot of talk about new members, new ideas, and stuff like that. However, one should recognize that all of that is just for show, as the real work is done behind the scenes. 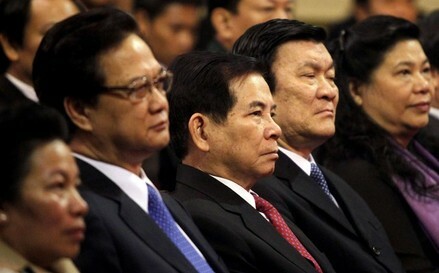 Even before the event, there are many rumors about who will be replacing Nong Duc Manh, Nguyen Tan Dung, and Nguyen Minh Triet as General Secretary, Prime Minister, and President, respectively. Not much is really known about the new “candidates,” though none of them have proved to be very exceptional in dealing with Vietnam’s many problems, both internal and external. 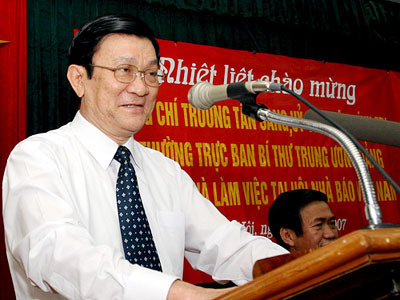 However, it is very likely that the current President, Nguyen Minh Triet will retire this time, rumors suggest that he will be replaced by a someone named Truong Tan Sang. Nguyen Tan Dung might get another five years as Prime Minister, while Nong Duc Manh might be replaced by another Chinese puppet, Nguyen Phu Trong, as the General Secretary of the VCP. Do all these names matter? Probably not, but hopefully yes. The Communist system of government is broken, afflicted with so many problems that each generation of leadership is succeeded by an even worse one. For this reason, I myself do not know what to expect of all this. Maybe there is a democrat hidden somewhere in the pack, just waiting to emerge from the ashes. Can’t help but hope for the best, right? 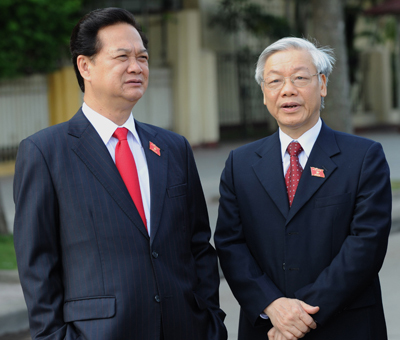 Pictures: Nguyen Phu Trong (top) is rumored to be the new number one, while Nguyen Tan Dung (standing with Nguyen Phu Trong) is expected to remain Prime Minister for another five years, and some speculate that Truong Tan Sang (bottom) has been chosen as the new President of the VCP. Whether these speculations are true, we will know in one week.